and compassion for others, the planet, and all living things. and may 2008 be a year of peace. When I lived in the States, one of my favorite ways to pass a Sunday morning was with a big pot of coffee, a pitcher of scalded and frothed milk, and the New York Times. Just the Magazine alone was worth the purchase price. Sadly, the Times is not available here in Asia except as a special purchase at a newsstand that imports days-old copies. Instead, you can purchase the International Herald Tribune, which is the Times’ international coverage and a smattering of US news, combined with some local stories provided by a partner newspaper in each particular country. It just isn’t the same. One of the things I like best about the Times is the quality of writing. I honed my appreciation for the written word by reading the prose in Times articles, which are written several grade levels above the average newspaper. These days I read the Times online. The writing is just as good but the experience is not the same. Still, I enjoy the reporters’ clever turns of phrase such as this choice bit from an article about some notable people who died in 2007. This quote comes from an entry about former longtime Missouri Senator Thomas Eagleton, the first running mate for George McGovern’s 1972 Presidential campaign, who resigned from the campaign after acknowledging his history of depression and mental illness. The federal courthouse in St. Louis is named for him. Accomplished men and women have recounted how they were awed by his intellect, influenced by his humanity, inspired and enlisted by his passion. Thomas Eagleton was a giant of Missouri politics. But he was a giant bound by ties of his own peculiar design. He spent the first part of his career in the grip of a secret. Later, he was fettered to a question he answered countless times but never resolved. 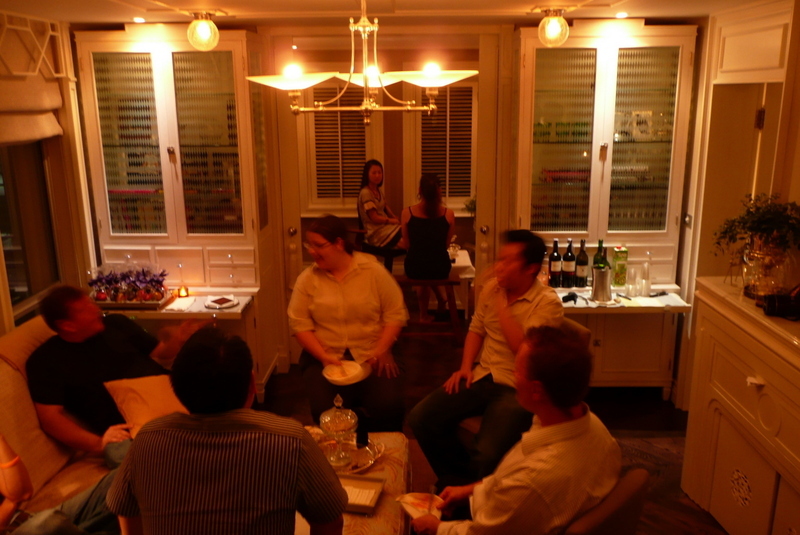 Entertaining friends at your home is not a particularly common feature of Thai living. 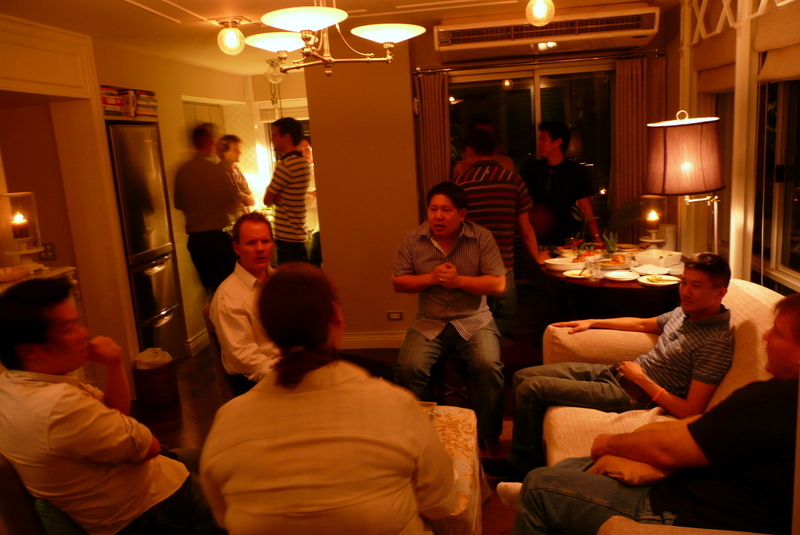 Instead, people will meet at a restaurant, bar, karaoke, or bowling alley and socialize there. Tawn and I really enjoy entertaining and it was an enjoyable part of our life in the United States. When we were planning our condo remodel, we made many decisions along the way that would help us maintain this aspect of our lifestyle. From redesigning the kitchen with a larger refrigerator to setting up the bedrooms so they could be used for socializing, we tried to build a space where we could host friends and family members in comfort. After having a small brunch as the first test of our home’s ability as an entertaining environment, we were ready for the next step in the proving trials: dinner for a dozen. Actually, it ended up being sixteen or seventeen, but who’s counting. Below: Moments before the first guest arrives, the stage is set. The condo looks especially nice at night. It further progressed to, “… and maybe I’ll order some Italian food if we get hungry.” Finally, it turned out as Eddy, Jack, David, Sa, Job, Mon and Ton came over for several hours, drank numerous bottles of wine, ordered pizza, pasta and salad from Pizza Mania, and kept me from getting all the prep work done I had hoped to. But that’s okay… it was nice to see them and I continued working while people floated into the kitchen to visit for a while, then floated back to the living room. 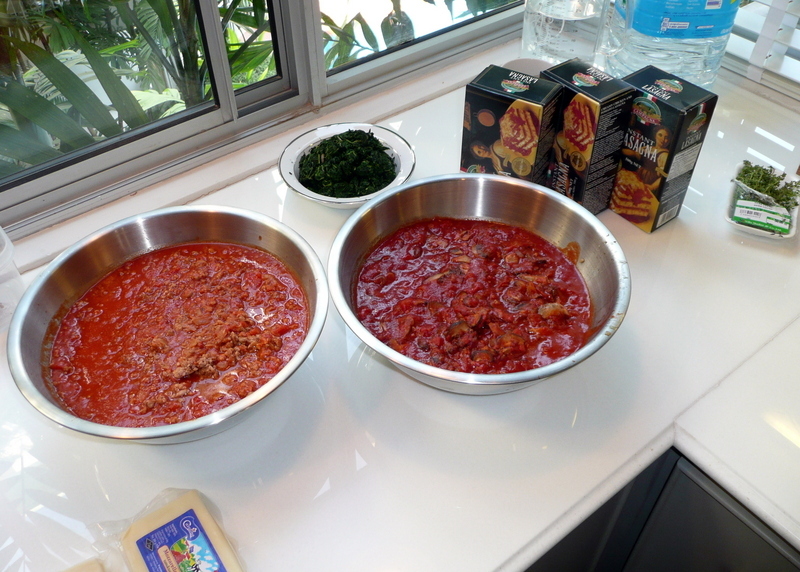 The only things I couldn’t do involved sauteeing onions and garlic, which I thought might annoy the guests a bit. When I lived in San Francisco, before Tawn and I moved in together, I lived in a 90-year old Edwardian house on Eureka Street, just above the Castro in a section of town known by longer-term residents as Eureka Valley. I had two roommates, Anita and Colleen (although both Holly and Nina lived there at various times, too), and we would have parties quite frequently. Usually, if they involved dinner they were smaller affairs – 8-10 people at the most. If they were just drinks and appetizers, the numbers would get larger. I recall these parties as being pretty uncomplicated. 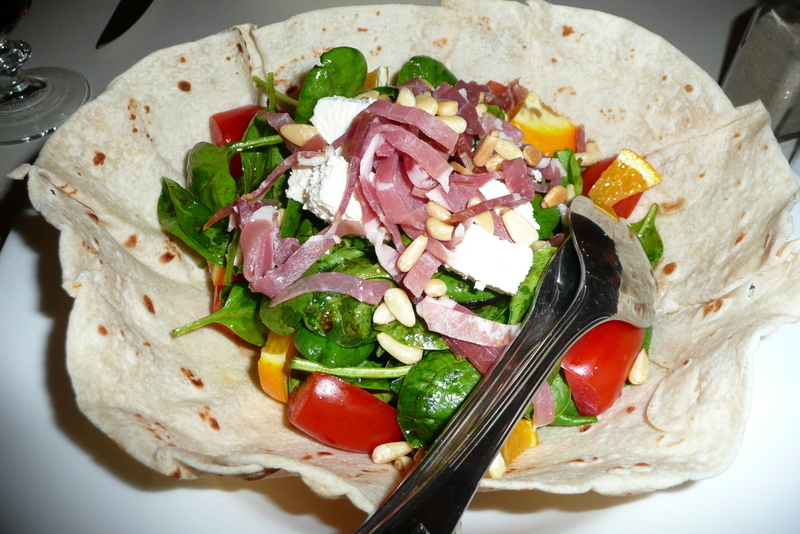 Tidy up the house a bit, light some candles, turn on some Miles Davis or Morcheeba, and wrap a round of brie in some filo dough and pop it in the over. Somehow, when Tawn and I host gatherings, it becomes quite complicated. Some of it is the food, although we’ve been learning and applying lessons and the food we prepare is increasingly prepared in advance, requiring little work during the party itself. In fact, by the time the first guest arrived Saturday night, the cooking was done. Some of the complication comes from the decoration. I think we put a lot of effort into arranging the house, decorating it, and making it like something out of a magazine. I’m sure the guests appreciate these thoughtful touches, but I suspect they wouldn’t mind or even notice if they were missing. For example, we provided party favors for our guests last night: pairs of macarons from the Erawan Hotel bakery, neatly wrapped in a cellophane bag with a festive bow. Really cute and very thoughtful, but it meant a trip to the hotel, waiting for them to wrap everything, and then an hour Saturday morning tying the bows. After our parties, Tawn and I debrief and try to see what we can learn to make our lives easier next time. Hopefully we’ll get a bit better at applying the lessons and not just learning them again and again, because we really like entertaining and want it to be an enjoyable experience for us, too. With that said, let me now regale you with all the cooking that was done! It was a pot luck dinner but I wasn’t sure how effectively that would work. First of all, many of our friends have small or nonexistent kitchens. Second, I’m not sure if a pot luck is really a very “Thai” thing to do. 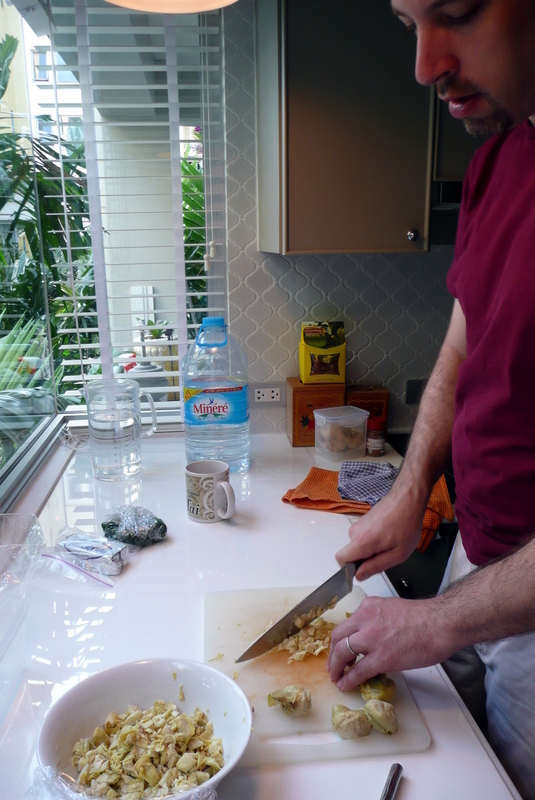 Right: Chopping roasted artichoke hearts for the dip. 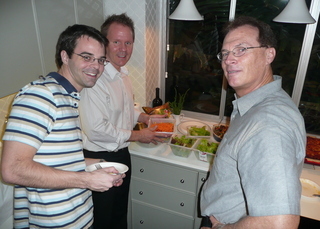 Our guests provided many wonderful accompaniments: a large mixed green salad, fried turnip cakes, a spicy Thai-style sausage salad, and desserts and beverages. Pot luck is a successful concept here so that means less cooking for me in the future. 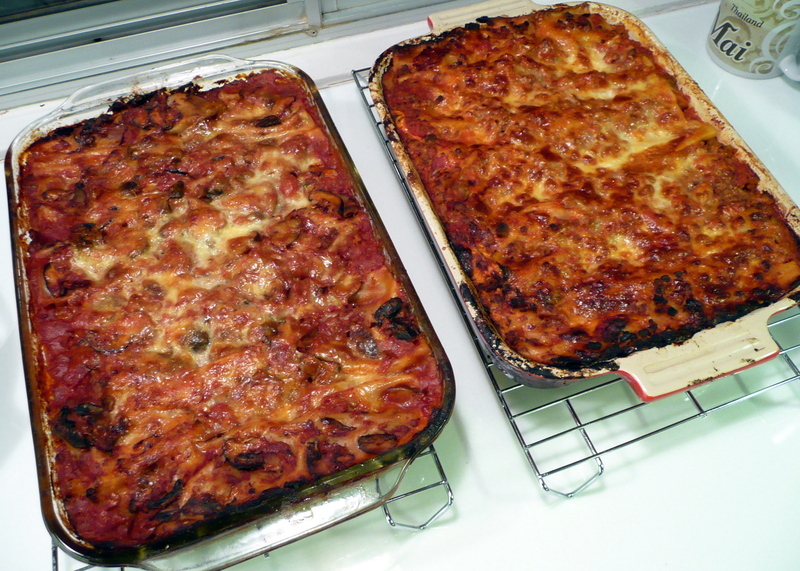 Below: Lasagna in three easy steps. 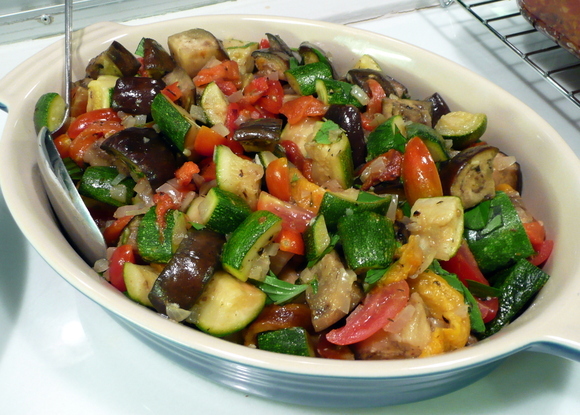 Above: The egglpant-zucchini medley. 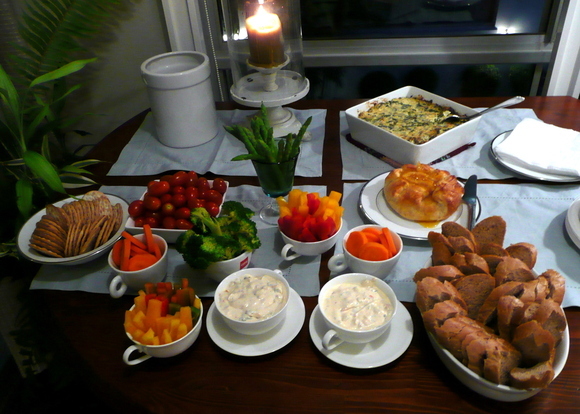 Below: The table is set with the appetizers. We ended up with a nice mix of people. In addition to the usual suspects of the American expats and their partners, Roka, Prawit and Kobfa, Tawn’s cousin Paul and his wife Nicha made a visit. Tawn’s friend and ballet instructor Mae stopped by with her Danish friend, Daniel. Vic also brought a volleyball friend of his, Kook, who recognized me and Tawn – it turns out that he works in the same building as Tawn for an advertising company that is under the same corporate umbrella as Tawn’s employer. Kook had seen us before at the Thailand Cultural Centre, and he and Tawn saw each other in the elevators at work but had never met. Furthering the coincidences, we discovered that Ken’s partner Suchai knows Kook’s brother. Small, small world. 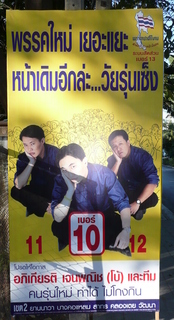 Right: Ken and Suchai in a rare display of public affection. Below: Russ, Bill and Vic fuss over the salad. Above: The second bedroom/office makes for a nice separate seating area for guests in the background. Below: Tawn’s cousin Paul (center) shares a story about his experiences working in China for the Central Group of department stores. Bill is to the left in the group and Kook is to the right on the sofa. In the end, it was a very good party. As people left, we sent food with them so that we ended the evening with only a small amount of leftovers. I think on my next trip to the US I’m going to Costco and buying a big box of those Gladware storage containers. We sent people home with some of my better quality storage containers and I hope I get them back as they’re kind of expensive! Things have been slow, socially, the past few days. A lunch here, a Thai lesson there, but not much that is blogable. My cousin Kari’s high school friend Sarah arrived from New York with her husband and another couple in tow. We met them for dinner last night at Cafe de Laos and then drinks on the rooftop Moon Bar at the Banyan Tree Hotel. But the week was pretty unblogable. Until the bookshelves arrived on Wednesday. 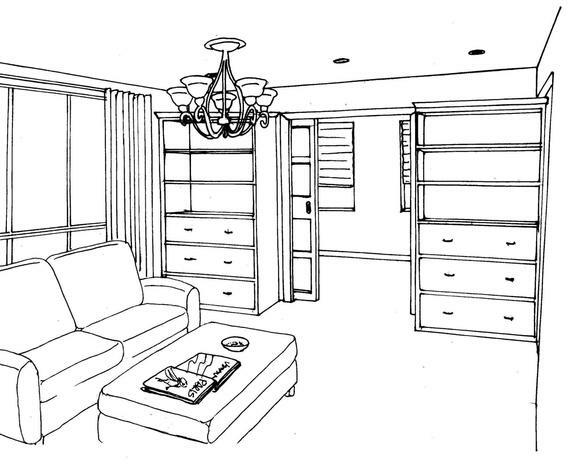 Some of you may recall this sketch I did before the remodel started, showing what I had in mind for the living room. A pair of pocket doors with traditional Victorian bookshelves built in on each side. All along, I thought this was the basic design that Tawn and I were working towards. In fact, the design had made a left turn some ways back but it wasn’t apparant to me. Somewhere along the road, Tawn showed me a picture from an issue of Martha Stewart Living (a woman whose name is starting to haunt me) and asked, “What do you think aobut this design?” I took it as a question relating to the china cabinet that we want to put near the kitchen and dining table. Not realizing that it was related instead to the design for the bookshelf, I said that it was okay. Below: Tawn discusses the options with the handyman (left) who installed our toilet paper hanger vertically because, he says, I told him to, and the general contractor’s son. Note the height of the top border on the cabinet. The workers left the shelves, drawers, and doors behind and took the top half of the cabinet back to the shop. They returned on Thursday and installed the new, slightly lower bookshelves. Width and depth issues have not been resolved but we’ll see about that later on. 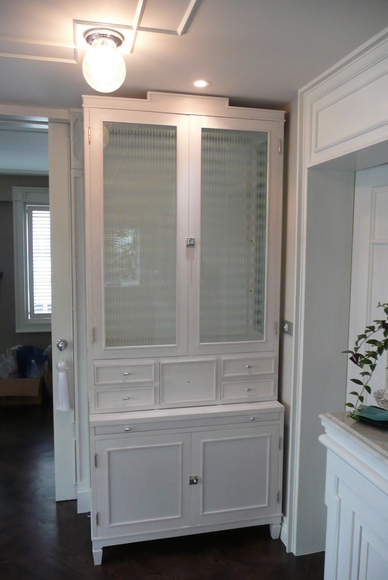 Notice that the border on the top of the cabinet is now narrower. So what do you think of the shelves? Personally, I think the design is nice for a china cabinet, which is what I thought the design was originally for. But as a bookshelf? I don’t know about that. One of the biggest problems is that the shelves in the top half are made of untempered glass and I’m not convinced they’ll hold the weight of the books. Especially since they have no supports in the middle. 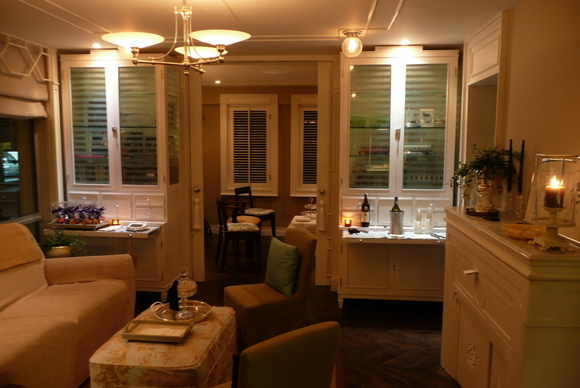 I also have mixed feelings about the glass doors and sides, which has a diamond pattern etched into them. If you’re going to have glass shelves, shouldn’t you have doors that allow you to display the contents? The whole point of glass shelves and doors is to show off your plates, platters and teapots, right? There is a little pull-out drawer, a feature I really like as it makes for a good side table or console… on a china cabinet. But not for a book shelf. Also, I really expected that there would be a gap of about 10 inches between the top of the shelves and the ceiling. That’s why we installed the little spot lights, to highlight the objets d’art we would display there. I’m not sure if it is realistic to slice off several inches of the cabinet, maybe all of those small drawers? Another option, which Tawn isn’t as keen on as he likes the cabinets, would be to try to sell them on Craigslist and use the proceeds to build another pair of bookshelves. Or, should I say, “to build some bookshelves” as I don’t think these are bookshelves? So just when things were seeming a bit na beua they became interesting again. Christmas is and is not celebrated here in Thailand. Christians comprise less than 1% of the population, yet the main streets and shopping centers are done up in holiday lights. A lot of this is for New Year’s, which is a big deal here, but Santa Claus and other imagery associated with Christmas (including trees) works its way into the decorations. Monday evening we met a small group of friends – Doug, Roka, Suchai and Ken – for dinner down the street at Bacco, the more expensive sibling of Basillico on Sukhumvit 31. The food is significantly better, more creative and of higher quality. We had papparadelle in duck ragout, a tuna tartare and pomelo appetizer, linguine with smoked salmon and vodka sauce, and a tasty arugula salad (right) and a variety of bruschetta. The conversation and company were wonderful, more than compensating for the slightly higher bill than I anticipated. Oh, well – you cannot regret what you’ve already done, but only learn from those lessons for the future. Afterwards, Tawn and I headed to Central World Plaza to try and take some holiday photos in what is the equivalent of Khrungthep’s Times Square. Last year the New Year’s Eve celebrations were dampened by a series of bomb attacks that killed three people and injured more than 40. 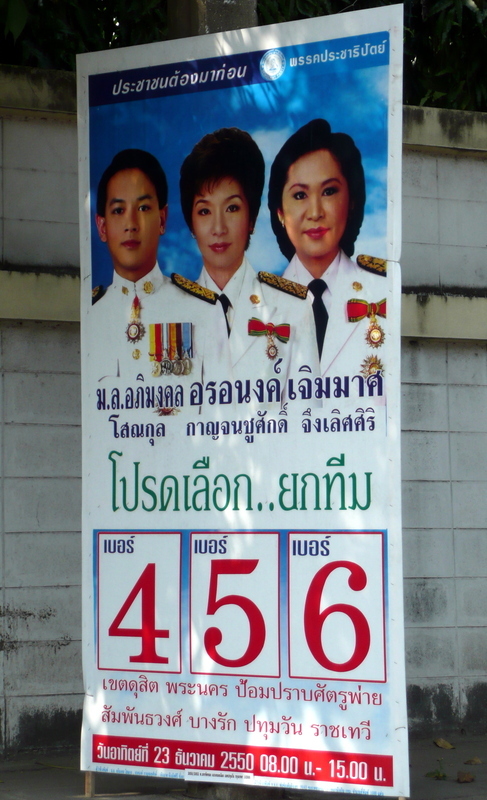 With the election of the PPP government, whose Thai Rak Thai roots were decidedly harsh on the South, we may very well expect more of the same this year. Sunday, December 23rd the Thai people went to the polls to elect a new government, the first democratic elections since a military-led coup toppled the constitution in September 2006. 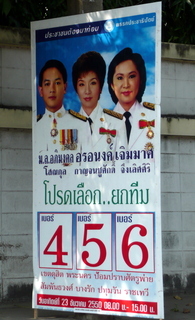 The coup government claimed that the coup was held because Prime Minister Thaksin Shinawatra and his Thai Rak Thai (“Thais love Thais”) party were corrupt and had undermined the nation’s democracy. After an investigation, a court dissolved TRT and banned 111 of its leaders from politics for five years. From the ashes of the largely populist TRT, which despite allegations of vote buying in previous elections seems to legitimately have the support of a large majority of the Thai citizens, rose the People Power Party. 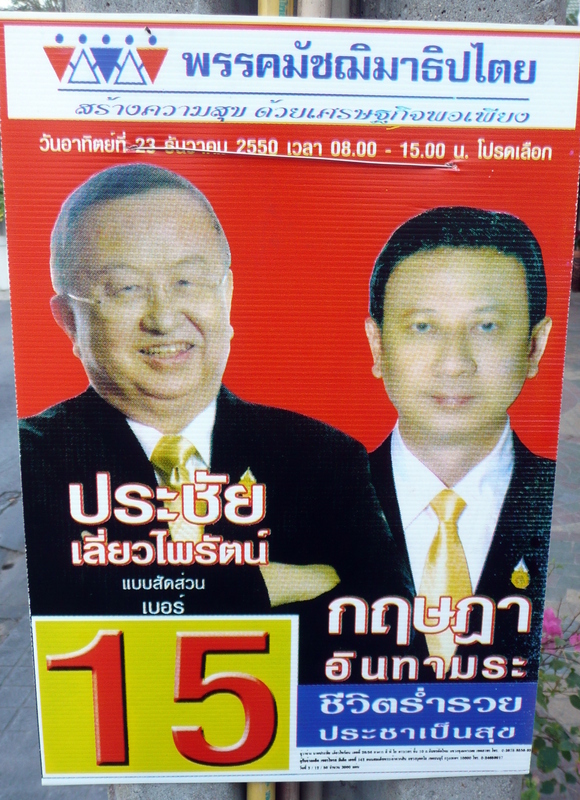 With obvious connections to exiled Thaksin, PPP leader Samak Sundaravej has made clear that one of the PPP’s planks is to continue TRT’s popular policies. Another plank is to let Thaksin return to Thailand and receive a fair trial. The implication is that the 111 TRT leaders could be cleared of all charges and return to politics. How much do PPP members support Thaksin? This Bangkok Post picture, right, shows them at a rally wearing Thaksin masks. TRT/PPP has been especially popular in the North and Northeast sections of the country, with Khrungthep forming the crucial battleground for the elections. 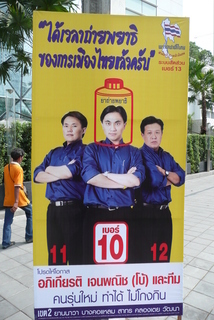 The 72-year old Samak (left), a crotchety veteran of Thai politics known for berating “irreverent” female reporters, faces off against the rival Democrat Party, led by 43-year old Oxford-educated Abhisit Vejjajiva (right) who was described by The Economist magazine as handsome but ineffectual. The Democrats, a historically conservative party that is royalist in nature that is the primary challenge to the PPP, has in recent years had a difficult time building any effective support beyond the urban middle class in Khrungthep and the residents of the conflict-torn South. 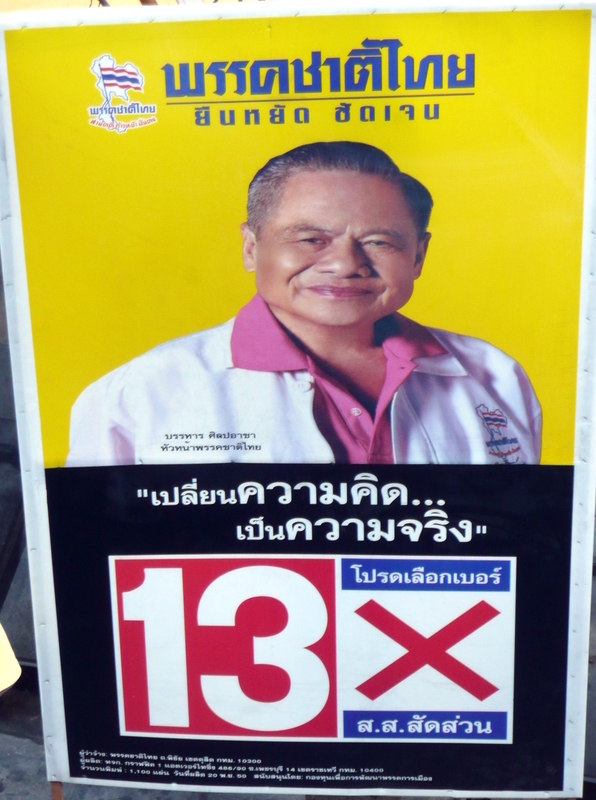 Thai election campaigns are more about parties than individual candidates. With the new constitution, each region of the country is given three representative seats so parties have promoted trios of candidates who are generally not notable with the exception of being from a particular party. We don’t need to know anything about them beyond their profession or the family they’re from. All we need to know is that they are a member of a particular party. The party leaders, Samak and Abhisit included, have been the only point where there has been any policy debate. Most of this has been general and couched in elusive terms. “We’re for the country and happiness!” could easily be the slogan of any of the seven parties. From upper left: “Please vote for all the team members” from the Democrat Party. Prachai Liawpirat, the leader of the Machimatitapai Party, an entrepreneur who is positioning himself essentially as a new Thaksin. 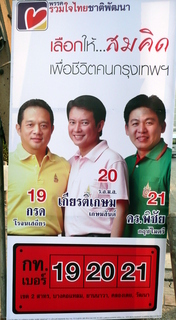 Ruam Jai Thai Chat Pattana Party (“Thai Togetherness, the Nation Progresses”) puts forth a slate of multi-colored shirts with the slogan, “Choose as you think best, for the life of the Khrungthep residents”. 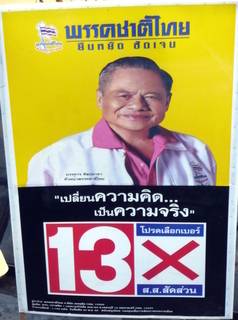 Chart Thai (the #3 ranked party) leader, Banharn Silpa-archa, who is known by his nickname “Tung” referring to his passing resemblance to Mao Tse Tung. Tung actually is a key player here, which I’ll talk about in a moment. 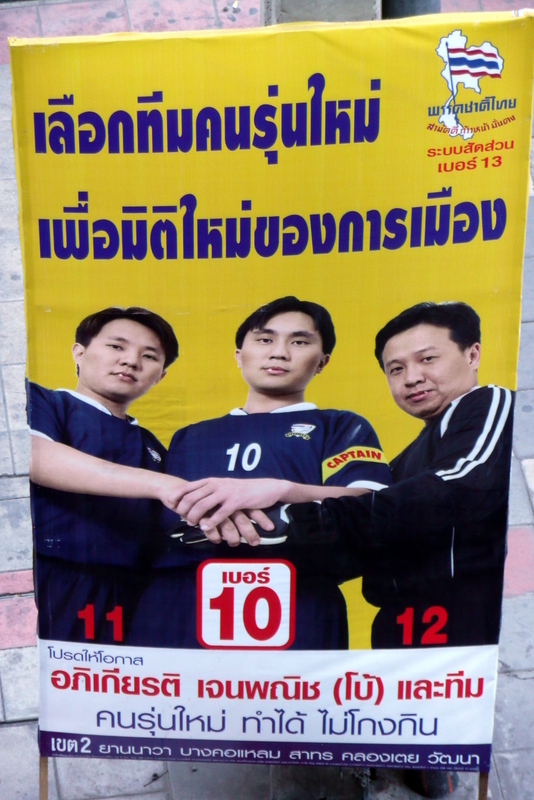 The only campaigning that was really interesting was that put up by Chart Thai’s Khrungthep candidates, who are really emphasizing their youth and being part of a new generation, fed up by the past. 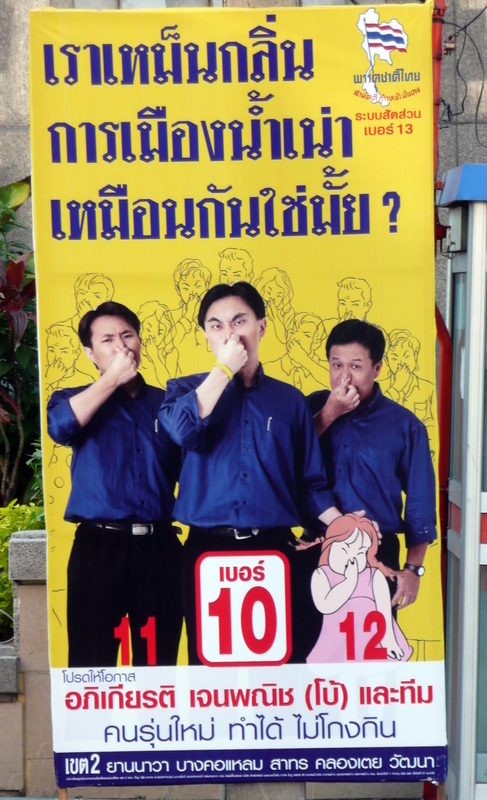 Their posters, four of which I’ll explain below, are really funny. Left: “We smell the bad smell of “polluted water” politics. 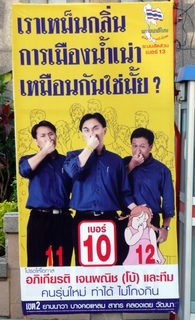 Do you also?” The line drawing behind them show a crowd of people holding their noses, too. 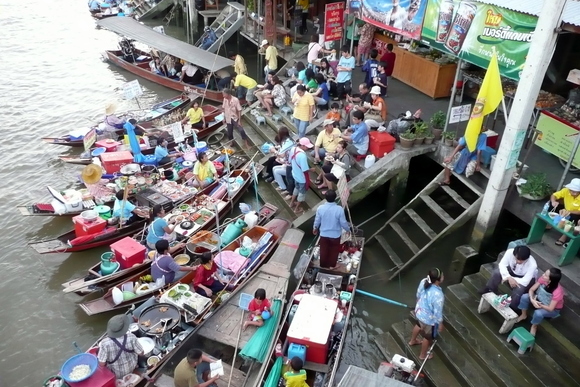 The expression nam naw refers to the polluted water that are underneath slum houses, for example along a khlong. The expression is used idiomatically to mean someone or something that is overly dramatic for no purpose. For example, soap operas on television are called lakon nam naw – literally, “polluted water show”. The funny event in all of this is that Tung, the leader of Chart Thai, was on a campaign stop in a slum area in Bangkok and the floor collapsed under him and he literally ended up in the nam naw. This led to all sorts of jokes that he, too, had been tainted by the bad smell of polluted politics. 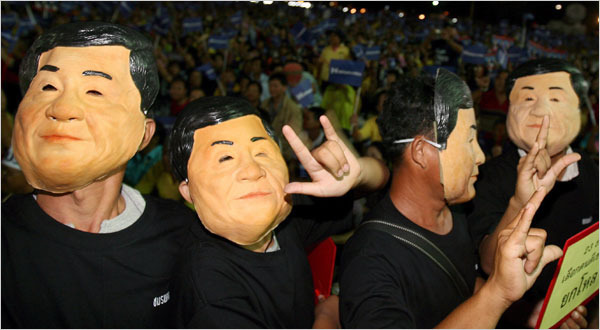 The last laugh will be on Tung, though, because unless the PPP or the Democrats get a significant majority in the elections, they will need to form a coalition government and Chart Thai is running third in the polls. As was pointed out after the nam naw incident, Tung might be smelling bad now but after the elections, the other parties will be coming up to sniff his cheeks. 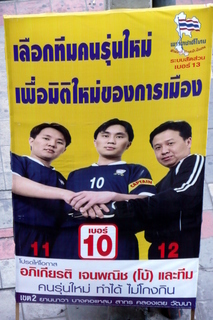 Left: “Choose the team of the new generation, for the new era of politics” featuring Apikiat “Bo” Janpanit (#10) as the “captain” of the team, a perfect allusion in this football-mad country. Center: “Time to take out the political tape worms” with an image of a tape worm medicine bottle superimposed over Apikiat’s face. Right: “Too many new political parties, but the old faces again? 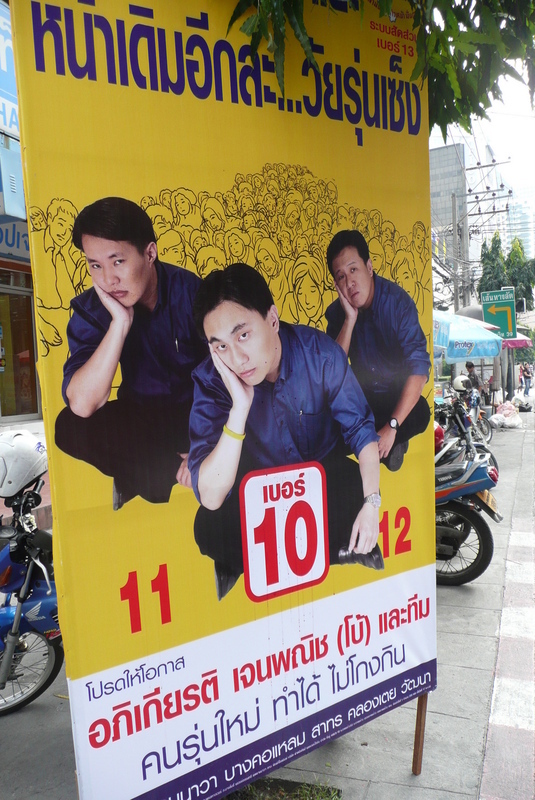 Young people get bored.” Despite #12’s looking like he isn’t part of the young generation, Chart Thai is trying to drum up support among the younger generation. The polls closed at 3:00 in the afternoon and three different exit polls are indicating that the PPP has won the largest segment of seats in the new parliament, although by how much is the question. One poll puts their lead at 256 of the 480 seats, to the Democrat’s 162. Other polls show the margin narrower. If the PPP does get around that many seats, they may be able to form a government on their own. But if their margin is narrower, they will have to form a coalition, which could lead to instability. Either way, there is no doubt that the political turmoil will continue. 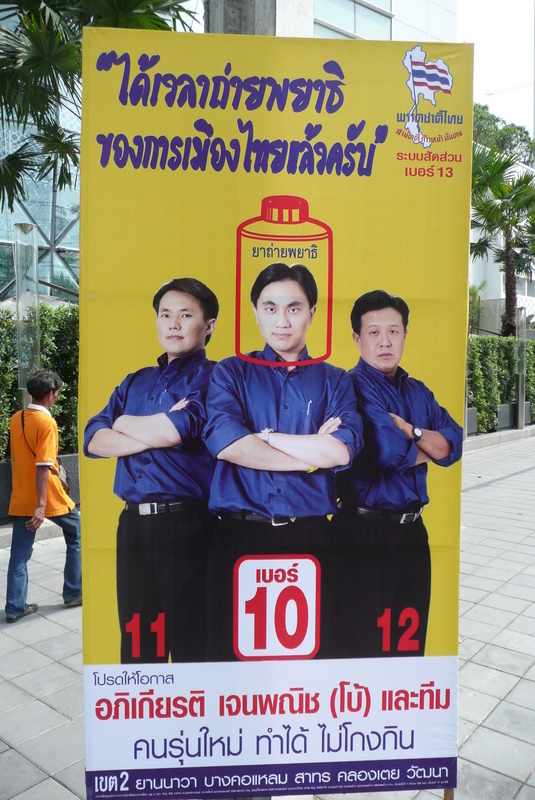 The current government was making overt efforts to discredit the PPP’s campaign before the election, including raising questions about vote buying and the inappropriate appearance of a campaign VCD distributed in the north with a message from Thaksin. This looks like groundwork to potentially invalidate the election results afterwards. In the past two weeks, the King has publicly appealed to the nation no less than three times – a rare excess of appearances – asking for unity in this difficult time. It will be interesting to see if his subjects pay heed to his request. One thing is certain: stay tuned over the months to come for more political uncertainty. 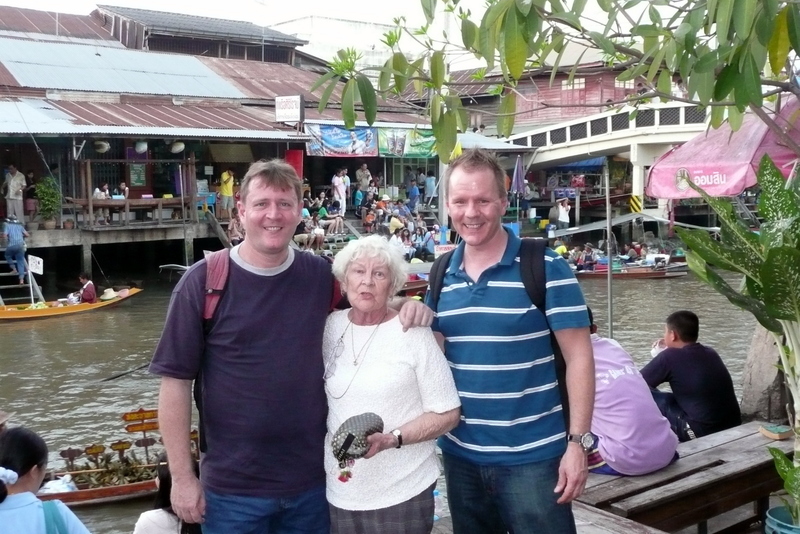 Friday night I drove Bill and his mother, Pat, to Samut Songkhram. Ken joined us. Bill is an American from Florida who has a Thai partner, Kom, and would like to move here. There seems to be some challenge in balancing his responsibilities back in the United States with his desire to live here. Right now, he’s in the midst of a several-month stint here of which is mother has joined him for one month. Unfortunately – and not to disclose too much personal information but this is relevant to the story – on her first day here, Pat had a mishap with a water feature in the lobby of the Marriott Mayfair on Langsuan Road. Thankfully, the injury was not as severe as it could have been, but it has limited the amount of travel she has been able to do. 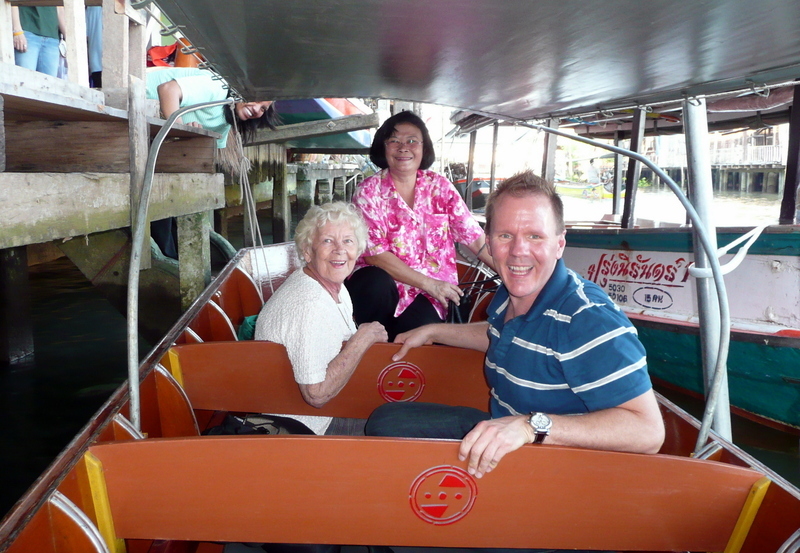 I offered to take them to Samut Songkhram province because there is an evening floating market at Amphawa. This is a much more local market held only on the weekends, and it has many fewer steps, is less physically demanding, and it is much less touristy. Or, at least, much less geared towards foreign tourists. 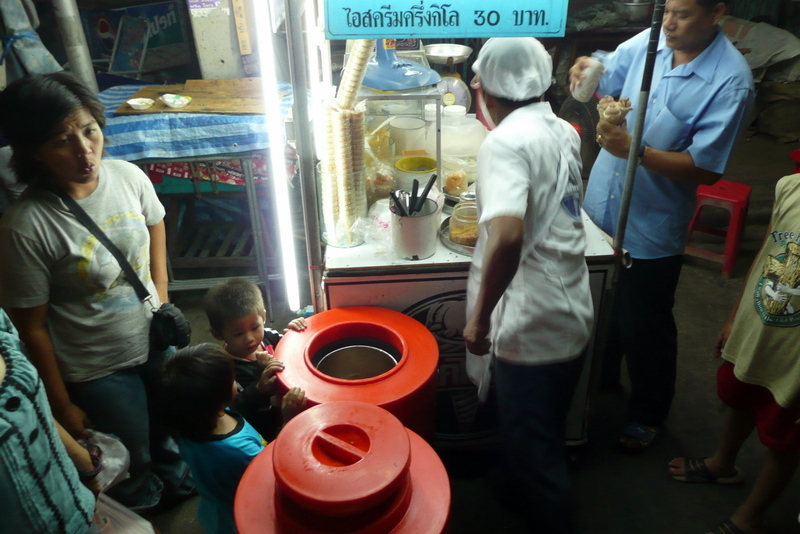 We met up with Ajarn Yai and then proceeded to the market, which was just getting started when we arrived about 4:30. Despite her unsteady legs, Pat agreed to a boat tour so we spent about an hour heading up river on the Mae Khlong and then turning in on a smaller canal that led back to the main market. 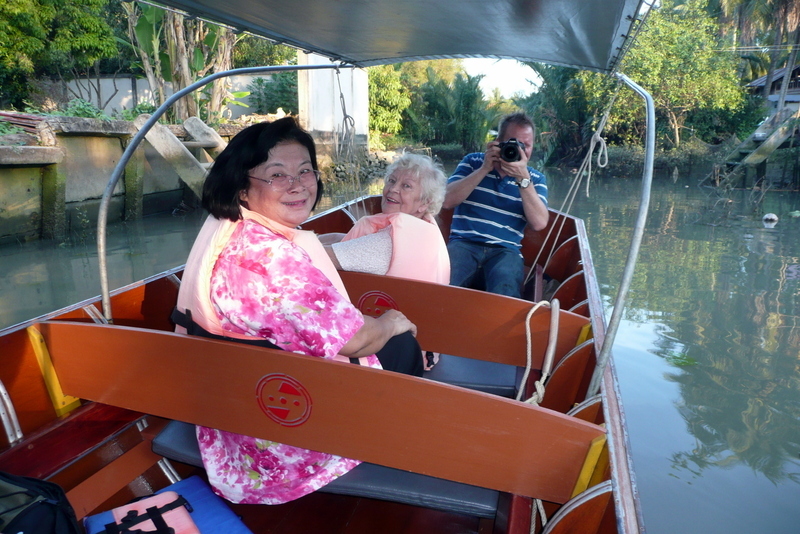 Unfortunately, it was low tide and our boat ran aground in the shallows of the khlong. (right) Pushing with a stick wasn’t sufficient so our driver had to roll up his pant legs and get into the water, which was knee deep. The theme to “Gilligan’s Island” kept playing in my head. Along the way, Ajarn Yai recognized a colleague so we stopped for a few minutes and visited. Then, back at the market, we ran into one of our former students, Wanwisa, who had graduated sixth grade last year and is now a student at the secondary school located next to the market. We ran into yet some more colleagues of Ajarn Yai’s later in the evening, reinforcing that this really is a local attraction. The market gets busy as the sun sets, with vendors serving mostly food and snacks to people sitting on the steps, above. 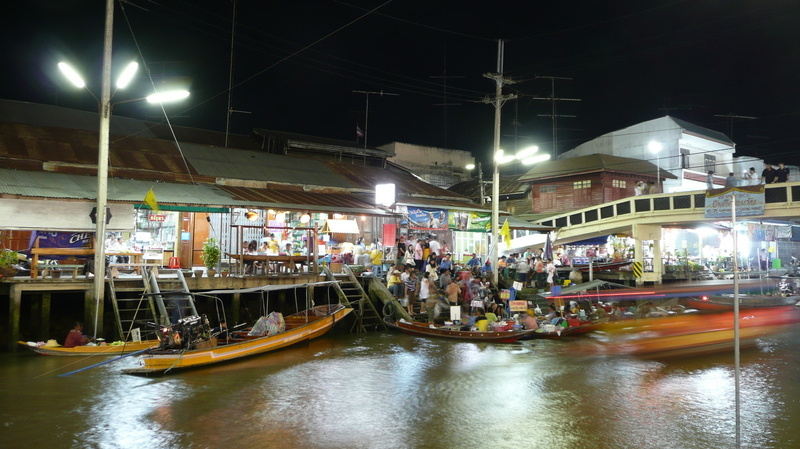 There are also some khlong-side restaurants, which is where we set up for dinner and where I took the picture at the top of this entry. Left: Ken, Pat and Bill standing along the canal after our boat ride. There is no shortage of good food in Amphawa, although I think some of the dishes were a little spicy for Pat’s taste. That’s understandable, so we ordered a big plate of khaw pad goong – shrimp fried rice – to fill everyone up. Sorry, no pictures of that! We strolled for a little while afterwards, looking at souvenirs and desserts. One Thai woman who spoke beautiful English – it sounds like she was educated in the UK or Australia – stopped me and asked where I was from, to which question I responded without thinking in Thai. Ma jag phratet America khrap. I am from America. Strangely, she said how she never sees any foreigners there. Strange, I say, because while there aren’t many, I had seen at least a half-dozen others over the course of the early evening. Our finally stop before heading home: ice cream! The ice cream vendor (right) was busy, offering both chocolate and coconut flavors, in a bowl, on a cone, or in a sweet roll. You could have it with chocolate syrup, evaporated milk, corn, sticky rice, or beans. And two little boys looked on, oh so eagerly. “When will it be my turn? When do I get my ice cream?” they seemed to ask. 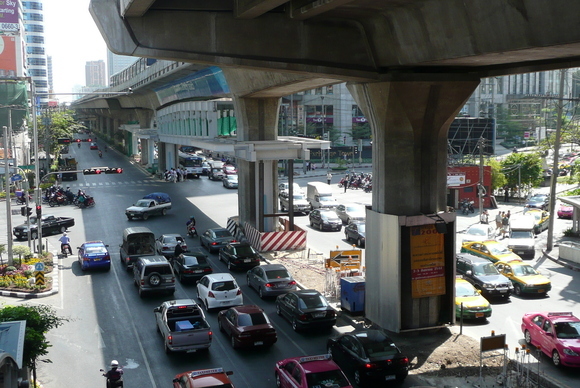 Above: The pedestrian bridge over Asoke Road along Sukhumvit has been put up. Still several months of work to do, but eventually we’ll be able to connect from the Asoke BTS station to the Exchange Tower building on the southeast corner. Below: Khruu Kitiya smiles for a photo after class. 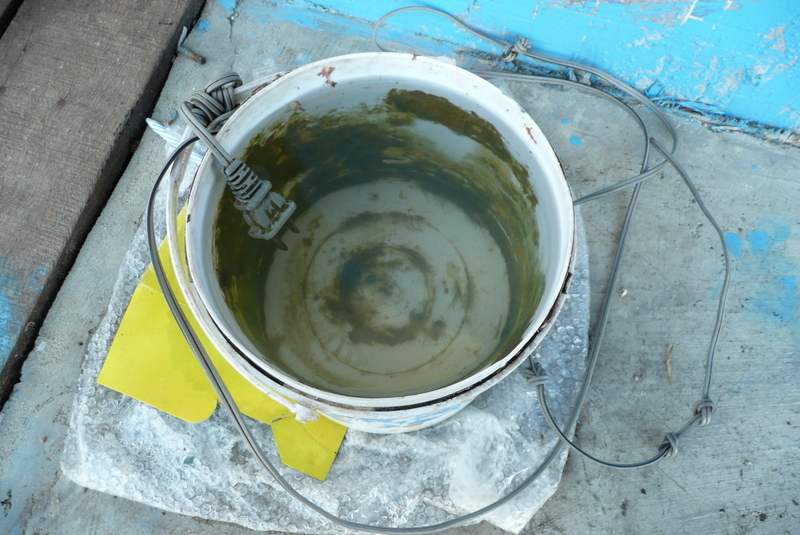 Above: Two things that don’t mix, electricity and water, are mixed on the sidewalk here in Thailand. A bucket of water sits with an electrical cord running into it.